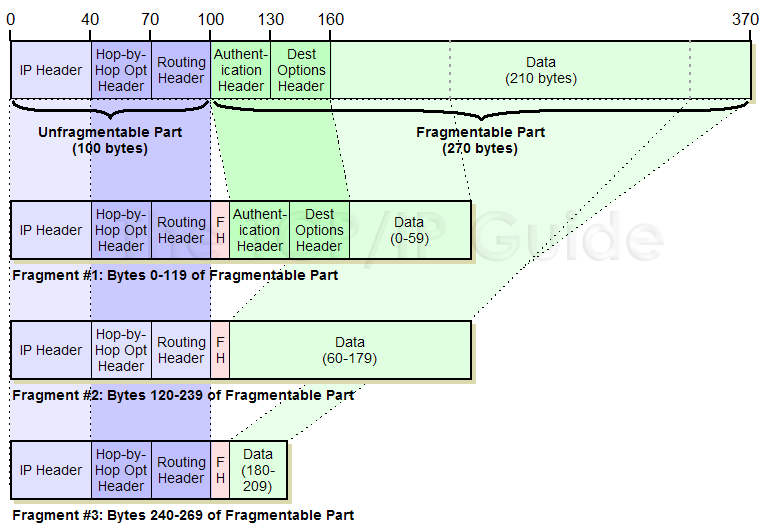 In this illustration, a 370-byte IPv6 datagram, containing four 30-byte extension headers, is broken into three fragments. The sizes of the fields are shown to scale. The Unfragmentable Part, shown in blue, begins each fragment, followed by the Fragment header (abbreviated as FH in the figure). Then, portions of the Fragmentable Part are placed into each fragment in sequence. The Authentication and Destination Options extension headers are part of the Fragmentable Part so they appear as part of the first fragment. First Fragment: The first fragment would consist of the 100-byte Unfragmentable Part, followed by an 8-byte Fragment header and the first 120 bytes of the Fragmentable Part of the original datagram. This would contain the two fragmentable extension headers and the first 60 bytes of data. This leaves 150 bytes of data to send. Second Fragment: This would also contain the 100-byte Unfragmentable Part, followed by a Fragment header and 120 bytes of data (bytes 60 to 179). This would leave 30 bytes of data remaining. Third Fragment: The last fragment would contain the 100-byte Unfragmentable Part, a Fragment header and the final 30 bytes of data. The M (More Fragments) flag would be set to one in the first two fragments and zero in the third, and the Fragment Offset values would be set appropriately. See the topic on IPv4 fragmentation for more on how these fields are used. The receiving device reassembles by taking the Unfragmentable Part from the first fragment and then assembling the Fragment data from each fragment in sequence.